Libre Tea is offering my readers a giveaway of a Libre Glass 'n Poly tea glass — perfect for sipping your favorite loose-leaf tea on the go! I live in Seattle, which is a coffee-loving city. I feel a little out of place without an ever-present cappuccino or latte to carry with me. Fortunately, the tea culture has also grown stronger, and there are so many yummy, high-quality teas to sample and tea shops to visit, and loose-leaf varieties have become the astute drinker's tea of choice for many ecological, economical, and delectable reasons. I now have a full cupboard of delicious teas, but till now I had no way to take them with me like all those cool coffee drinkers. 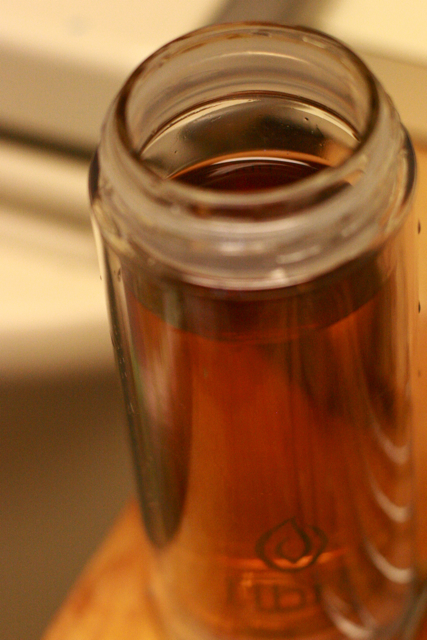 That's why I was so excited to receive the Libre tea poly 'n glass to review. Now I can look like the cool kids, or even better, since my glass is so unique and aesthetically pleasing. And speaking of cool, this glass works perfectly for iced tea as well as hot, perfect for the summer months! The first thing you need to know about the Libre is that it's pretty. Oh, so pretty. These are all the parts. It's simple, which is good, and it all feels like very high quality. The box includes instructions for how to use the glass, which you can also read on Libre Tea's website and even watch a couple little videos they have. 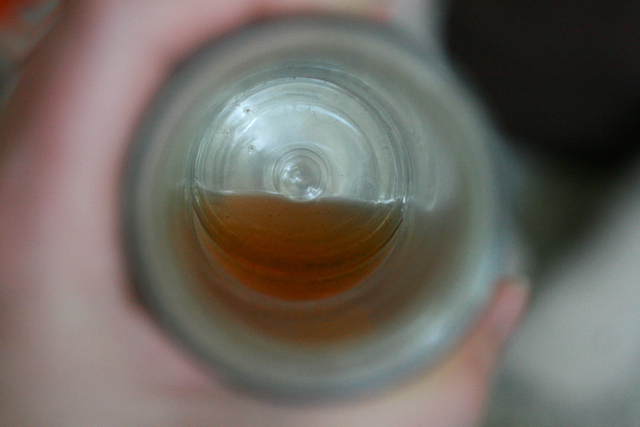 In the picture, you can see the two parts to the top: the filter at left and the cap at right. It's best to handwash the glass, but it's easy enough to do. This is the poly 'n glass version. There's also a glass 'n glass version, if you prefer all-natural materials. All glasses are made in China. Both versions are double-walled and thermal to keep hot tea hot and cold tea cold. The poly 'n glass version is a little lighter and less breakable (good if you're going to be slinging it around in a bag, or are just clumsy like me!). The glass 'n glass keeps hot tea hot for slightly longer. The difference in price is only a dollar. The poly 'n glass model has two different ways to brew, and I prefer the method that the glass 'n glass does not allow (see below). For me, the poly 'n glass is the better choice. So, there are two ways to brew tea with the Libre poly 'n glass. This is the way I prefer, which is to fill the glass with boiling (or near-boiling) water up to the bottom of the filter, screw the filter onto the top of the glass, put your loose-leaf tea into the filter, and then flip it upside down to brew. When it's done brewing, you can flip it back over, remove the filter and cap as one, and drink from the glass once the tea has cooled to the right temperature for you. The other way works for the glass 'n glass as well, which is to put the tea into the glass, then screw on the filter, pour boiling water in, then drink. I prefer the upside-down brewing (which is not possible with the glass 'n glass) if I don't have a separate teacup to pour it into after brewing; otherwise, the tea steeps too long for my taste before it's cool enough to drink. When trying it out that way and trying not to oversteep my tea, I ended up burning my tongue (oh, poor me!). Note that you can also use tea bags with the Libre tea glass; there's no law against it! So whatever you have or is easy for you, feel free to pop your tea into the filter, screw on the lid, and then tuck the glass into your bag to bring with you. Then when you're at work, on a hike, at a coffeeshop, or over at a friend's house, all you need is to bum some hot water and your tea will be ready in minutes! This shows the tea brewing upside down. Please follow the directions, which I didn't do, to allow 2-3 minutes to pass after adding the boiling water for the water to cool slightly and steam to escape before screwing on the filter and cap and turning upside down. Otherwise, you will have some leaks of hot water, which could be a disaster if you put your glass near your laptop or day planner! Once I let the steam out and made sure the cap was absolutely secure, I had no problems with leaks, so just be obedient, unlike me. I took this picture to demonstrate that the filter, though it looks like the holes are wide, will contain most types of loose-leaf teas. The first tea I chose, a black tea, did not drift at all through the filter. The second tea I chose specifically because it had smaller flakes, and only a few specks were left in the glass at the end, not even enough to do a tea-leaf reading! It might depend on your specific tea preferences, but the filter works effectively for me. I hear, though, that they're considering a finer mesh for the future for customers who prefer very small-leafed tea. Once your tea is steeped, drink up! If you want your tea chilled, simply prepare it in advance, adding sweeteners like honey when it's still hot enough to mix in as desired, and then store the glass in the fridge or add ice cubes for an iced version. Ah! Sweet summery goodness, and it will stay cold for quite awhile. 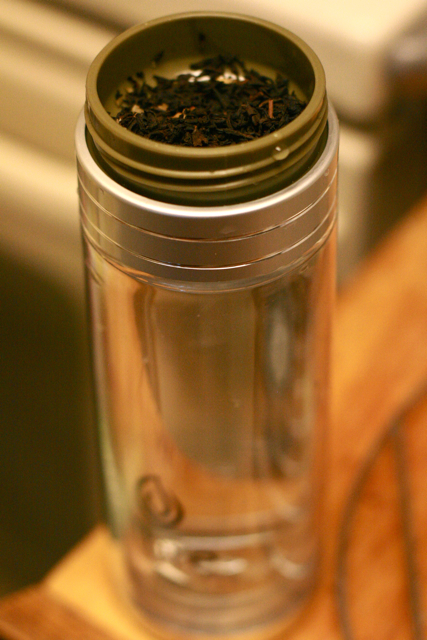 I found it was also possible to rebrew the leaves that were left in the filter, so you can save on tea in that way. In fact, I liked one of my brews better the second time around! I poured the hot water directly through the filled filter on that occasion, and it brewed it almost instantaneously and was really rich without being overdone. You can also use the Libre tea glass for any beverage that you think would benefit from being shown off in an elegant, see-through glass, so if you run out of tea while you're out, you could always refill the glass with water or some other beverage. The poly 'n glass holds about 9 ounces of liquid, which is the same size as one of our teacups at home. I did a quick search, and it seems like traditional teacups are about 6 ounces, whereas oversized mugs can be much bigger. At any rate, 9 ounces felt like a good tea amount for me! But, as you can see, he loves the tea glass, too! By the way, after watching Wendy of Libre Tea's videos, I realize Mikko and I are (mis)pronouncing Libre more the Spanish way, but she's doing more of a French version — my high-school Spanish kicked in by accident, but now you'll know better. So now tea lovers can be as hip as coffee lovers — if not more so! 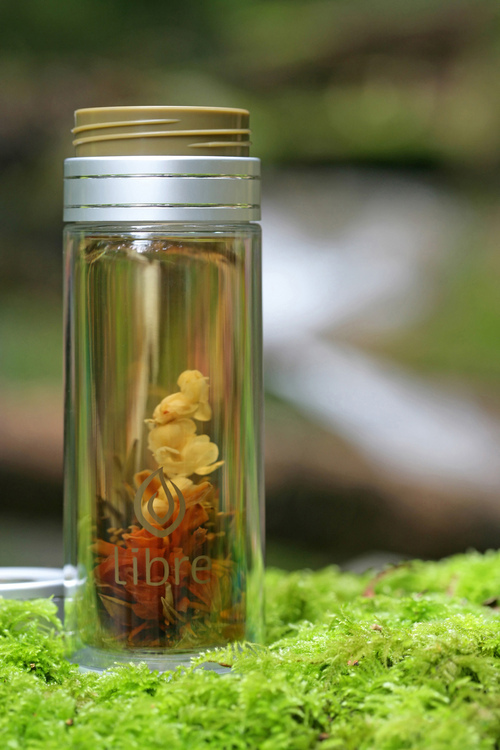 Enjoy your tea on the go with the Libre tea glass. You can purchase the Libre tea glass at LibreTea.com at $24 for a glass 'n poly model (the one I reviewed) or $25 for a glass 'n glass model (at left). You can also shop on Amazon. Libre Tea ships glasses readily to the U.S. and Canada from warehouses located in each country, and you can contact by email for other international shipping quotes. If you are in British Columbia, Alberta, or Ontario, Canada, you can also find the Libre at several retail locations. There is a distributing company within the U.S. and Canada as well, so you could check likely retail locations near you (natural food stores, tea shops) to see if it's stocked there yet, and recommend it if not. For your own chance to win a Libre Tea Glass, enter in the comments below! Contest is open to U.S. & Canada. 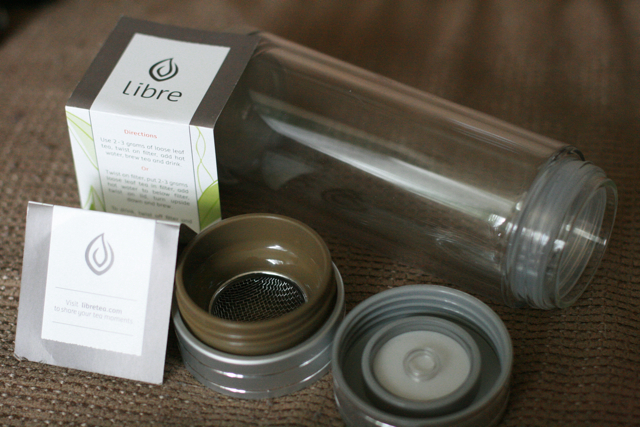 MAIN ENTRY: Visit Libre Tea and tell me how you would use your tea glass! Leave a comment on Libre Tea's blog, and tell me what post you commented on. Have a look around Libre's site, and tell me something you learned. Follow @libretea on Twitter and leave your Twitter name in the comment. Like Libre Tea on Facebook. Contest closes August 12 at 11:59 p.m. PDT. 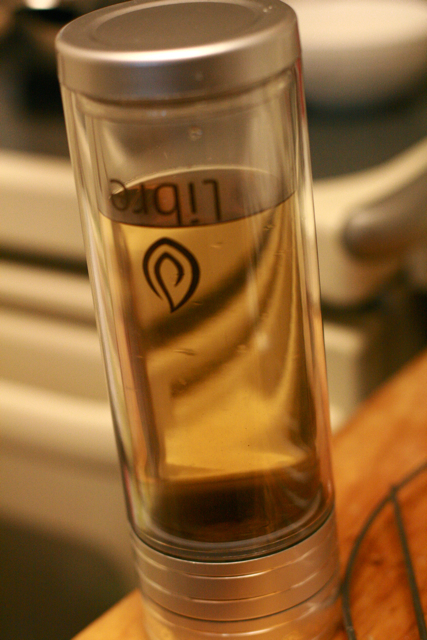 Disclosure: I received a free Libre Tea glass for review. opportunity to me since she doesn't drink tea! I'd use this at my office. I would use this out and about everywhere! I wish I drank more tea, but motherhood is so exhausting and time consuming (and awesome) that to actually brew some tea and sit down with a mug seems like mission impossible. info at mamaandbabylove dot com. I commented on Libre Tea's "A Toast to Canada"
I'd use this for bringing my tea with me to work, when I'm doing research, and traveling. I liked HoboMama on Facebook. I would use this at work. I've been suspicious of teabags ever since I read that the chemicals they use to make the paper strong enough to survive the brewing process probably have all kinds of carcinogens and stuff in them. This would solve that problem! Thank you! Any stay at home Mom can tell you how we do anything but stay at home. I'd love one of these to take on the go! I would use my Libre Tea glass everyday! I'm a teacher and I love to boil water and then take my tea to school! I would carry this with me everywhere put it in a backpack or bag and shop in little tea shops for tea leaves. 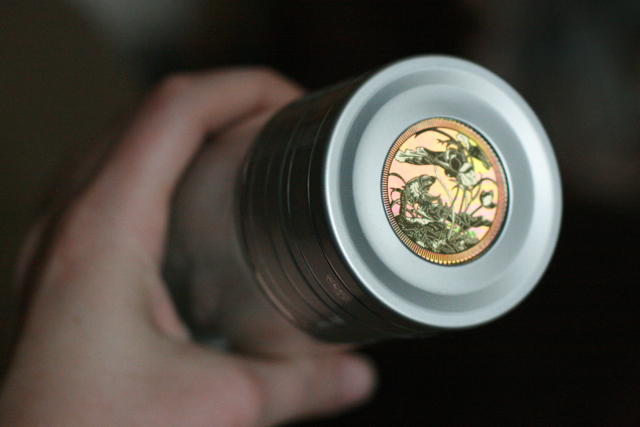 What a clever and gorgeous way to brew tea! I drink tea like it's going out of business. This would be fantastic to keep it nice and hot! You should try the Chamomile Citrus @ Mighty Tea. Very mellow with a hint of citrus flavors. I learned that teas are affected by soil, climate, weather and time of picking, just as grapes are when creating wine. I would use this everywhere I go! What a lovely idea! I would use this at my home and trips to town. I would just love to use this at home! I would pass this along to my mom because she loves loose leaf tea! This would be perfect for her to take to work instead of lugging around her glass tea pot! I'm a tea aficionado, so I would ust about bring this anywhere with me. It looks so pretty too! I Follow www.HoboMamaReviews.com via GFC. I would use this at morning playground playdates! 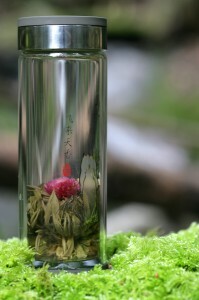 I like the Jasmine blooming tea balls, the kind that unfurls into a flower when it steeps. I learned that Chinese Emperor Shen Nung discovered tea when a tea leaf accidentally fell into the bowl of hot water he was drinking. Hobo Mama, this is a tea drinkers dream! I simply can't get enough tea, and I have two tea plants growing in my yard. I drink tea both cold and hot. 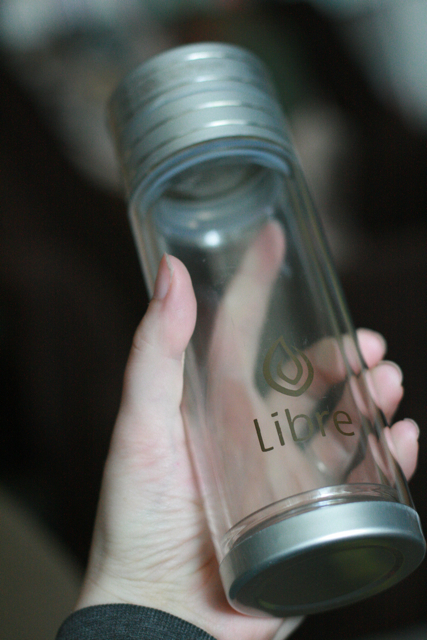 I would use the Libre Tea Glass pretty much on a daily basis. I would use it at home and on the go. This would be perfect to use with my loose black tea, green tea and white tea varieties. Sweet tea is my favorite Southern beverage. I love TEA! I also love to make Yerba Mate to take on the go but I do NOT like drinking out of stainless steel. This is such a beautiful tea glass to travel with or to take to the beach early in the morning!!! This is SOOOOO cool. My husband and I have a small tea business and I've never heard of this before.....I would DEFINITELY use this often for my "Finest jasmine pearls." MY fave tea hot or cold. I would use it to take my tea with me to Bible Class on Sunday morning. It is really the only time I drink tea on the go. I commute to school and hour each way so saving me the time to brew my loose leaf tea in the morning would be great. I would love to be able to reuse the leaves once I got to school too. Thanks for this awesome giveaway! My favorite loose leaf tea is one I grew myself. I currently have chamomille, peppermint, and spearmint. I would use this as I was walking around, harvesting my veggies from my gareen. I love that it's BPA free! I'd take the glass-n-poly in the car--I never allow enough time in the morning for a hot drink at home! My favorite loose leaf tea is Tea Kuan Yin. There seems to be lots of varieties but I buy a very large decorative tin with single serve packages from the local Asian grocer. ps- Their shop comes up 'not found'! I commented on the Canada day post! I learned that herbal teas are not true teas as they have no actual tea in them :) They are herbal infusions. I could not find a friend connect button on the blog but am now following via google reader! My coworker is from Argentina and thinks I'd get hooked on yerba mate if I tried it! I'd use this tea glass to try it out! I also am trying to cut down on coffee and if I had something this beautiful to drink out of, it'd be much easier. Holy cow, that's a lot of entries! I love tea, and would gladly use this any time, any where. I live in the PNW too, and don't really drink coffee, and this would be great all year! I would use this while working. Coffee is wonderful for morning commute and then I'd like either hot or iced tea during the day. We have access to hot water but making a pot of tea is too much. This would be so much better than using tea bags. I was just gifted a tin of Harney & Sons African Autumn - caffeine free red bush w/ cranberry and orange and highly recommend giving it a try. The Libre site had a history of tea link. Tea origination stories include a tea leaf falling in a Chinese emperor's hot water that he was drinking and also that leaves were boiled testing for medicinal properties. Both origin stories have been long told in China. I'd use it every afternoon, after picking kiddos up from school. That's when I make my premade iced tea. But I'd much rather make it fresh. Yummo! Following Hobo Mama reviews via google friend connect. I am drinking more than tea than coffee these days and would take the Libre with me whenever I am out and about. Ice tea, in the summer, hot in the winter. Not really a recommendation, more a preference... I love the Rooibos tea you get from South Africa. whoa, this is perfect for me. i love getting iced tea at the coffee shop by my house and they make it half peppermint/ half jasmine from loose leaf tea. it is really good! this container looks great for making my own tea at home. I'd mostly use it at home since that is where I spend most of my time. I would use this at home. Great Giveaway! I "liked" Libre Tea on Facebook. I entered the Amy Adele Children's Stationery Giveaway. I would definitely use this at work for my loose-leaf lychee tea! We've been trying to kick our "cans of soda" habit, so I'd use the Libre to drink iced tea on the go! i learned the stainless steel filter keeps the tea leaves away from your mouth and is easy to remove for easy access and easy cleaning when adding or emptying loose leaf tea. I'd prefer to make my tea by having the tea on top of the twist off filter, I think it would be much easier for me this way. I'd use it for red raspberry leaf tea in the mornings, hopefully before the kids wake up--and I've been meaning to branch out a little and find some other good teas to drink, too. Hobo Mama Reviews is in my feed list. Hobo Mama is also in my feed list. And I entered the WondaWedge giveaway. I would definitely use it anywhere! It's so convenient to use! I followed Hobo Mama on GFC! I followed Hobo Mama on Twitter! Q. will the Libre glass’n poly break? This Libre is much more durable than the glass’n glass although I have heard of a few that have broken. Over all customers have advised it is more durable than they expect and personally I have dropped it on a kitchen floor from counter height, on the road out of my car and on a cement garage floor without breakage. Beauty and function together! I would love to have a way to have a little mommy treat on the go with my kids. We are always running to various homeschool things, field trips, etc. I had never considered the fact that loose leaf tea has a lower ecological footprint (as stated on the Libre website). I'm sold! I love lemongrass and spearmint tea. Subscribed to Hobo Mama RSS feed. Subscribed to Hobo Mama Reviews RSS feed. I would use this to brew loose-leaf tea because I have not had much luck with infusers. I've recently become interested in hot tea and trying all different varieties, so I would love to win this! I learned from the Libre website that the caffeine in tea is released at half the rate that it's released in coffee. I have a long drive every morning. I would use the Libra Tea glass to carry with fresh tea with me. I'd take this to yoga class with me! time consuming (and awesome) that to actually brew some tea and sit down with a mug seems like mission impossible. I can't decide whether I'd give it to my mom or use it myself to easily make the various loose teas floating around my kitchen. I love jasmine flavored green tea - the one I have is imported from China by Fujian. I never knew that they brewed tea with salt and ginger when it was first discovered. Yeah! What a great mug! 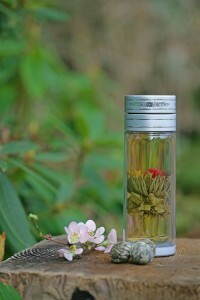 I love tea and would love to have a good on-the-go cup for loose leaf tea. I'd slap in into the side pocket of my backpack and we'd be off!